VMware Workstation 14: "Error: Not enough physical memory is available to power on this virtual machine with its configured settings." When starting a virtual machine on VMware Workstation 14 and Fedora 27 (Kernel 4.13), the following error is displayed, and the virtual machines cannot be started. However, there is plenty of free memory on the system. 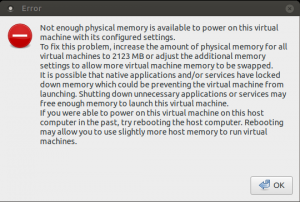 Not enough physical memory is available to power on this virtual machine with its configured settings. VMware Workstation should now work and the virtual machine should now start the next time you start it.